The Little Live Pets range has already captivated my little ones’ attention and imagination, we’ve had fun with chirping chickens, racing ladybirds and even a sweet mouse. The new Lil’ Cutie Pup is no different, a cute puppy to be your child’s friend that will interact with him and even plays ball! 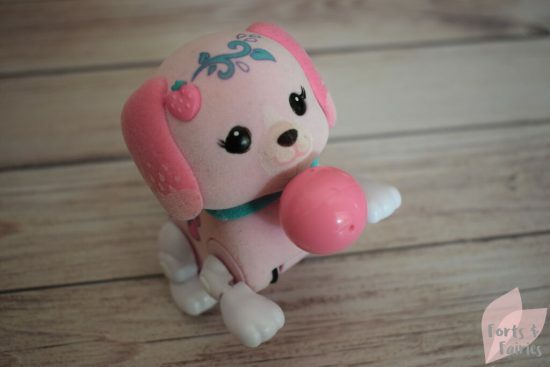 There are three different Lil’ Cutie Pups to collect, each with their own personality represented by their name and decorative design on their head, body and even their ball. 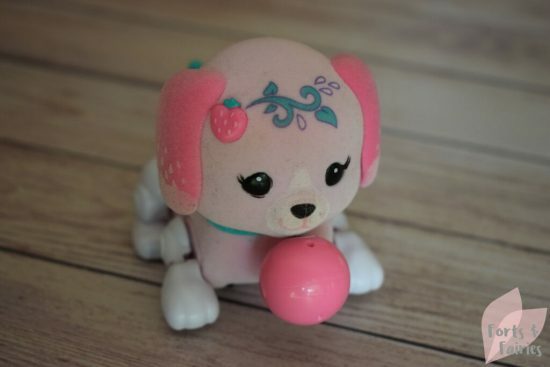 Pawberry joined our family a little while ago, a sweet pink pup with a strawberry on her head and body. It didn’t take long for the kids to fall in love with her, in fact I think it was love at first sight! Pawberry enjoys exploring and will run around wherever you place her. She loves to be petted, and if you stroke her head she will bark for you. She can even sing if she gets very happy, and if you balance her on her back legs she can beg by crying too. If you leave her in the beg position she will eventually resume her exploring. She’s a pup of many skills, and she can pick up her ball and even run around with it. Just make sure the icon on the ball is lined up with the underside of her mouth and she will pick it up happily for you. Her on/off switch is on her back and it’s easy to use. If you don’t interact with her for a little while she will also doze off to sleep and you’ll hear her snoring. If you want to wake her up again just press her tail and she’ll be ready to play again! You can also let her fall asleep by holding your finger on your pup’s petting sensor on her head. The Little Live Pets: Lil’ Cutie Pup is a fun toy for children of all ages to enjoy, each pup is cute and encourages imaginative roleplay that will keep the whole family giggling. 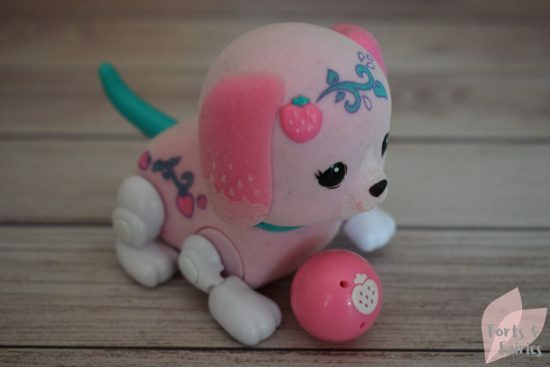 The Little Live Pets: Lil’ Cutie Pup is available from toy stores and online retailers for a recommended retail price of R399.99. You can also purchase the Lil’ Cutie Pup in her own Puppy Playcase. Thanks to Prima Toys for bringing even more puppy love into our home!